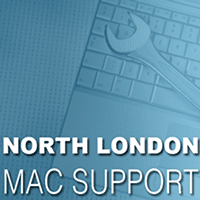 The term ‘[North London Mac Support (N.L.M.S or NLMS)]‘ or ‘us’ or ‘we’ refers to the owner of the website. The term ‘you’ refers to the user or viewer of our website. • This website contains material which is owned by or licensed to us. This material includes, but is not limited to, the design, layout, look, appearance and graphics. Reproduction or copying of any of our text is prohibited in intellectual copyright law, and in accordance with the copyright notice, which forms part of these terms and conditions. • Data & Security: It is the client’s responsibility to ensure that prior to North London Mac Support (N.L.M.S or NLMS) inspecting or starting any work on its computer system or other equipment, that all critical data has been backed up, and that appropriate recovery procedures are in place, prior to our acceptance of hardware for inspection or repair. We may at your request, attempt data recovery at a further cost. Success cannot be guaranteed where data is concerned. • North London Mac Support (N.L.M.S. or NLMS) can accept no liability for loss or corruption of data stored on clients machines whilst being inspected or repaired. It is the clients full responsibility to ensure a recent backup is made prior to sending any machine in for inspection or repair. • Service: Completion dates for repairs are estimated and are typically between 1 hour up to 7 working days and depend on the availability of parts and other factors. While we make every effort to meet these timescales, we cannot be held responsible for delay, however caused. Please ensure that all your equipment and accessories (including power cables) are listed on the service report, We can only be responsible for the return of those items listed. Repaired hardware will be stored for three months after the customer has been notified of completion. After this time, they may be disposed of and any disposal proceeds will belong to North London Mac Support (N.L.M.S or NLMS) is not an Apple Authorised Service Provider, or affiliated with Apple in any way. • Payment Terms: Strictly by immediate payment unless by prior agreement or account. Unless otherwise expressly stipulated by North London Mac Support (N.L.M.S or NLMS), credit account invoices are due and payable in full 30 days after the invoice date. If an invoice becomes overdue, we reserve the right to charge interest on overdue amounts at 3% above the base lending rate of National Westminster Bank Plc, from the time the amount becomes overdue, until the invoice is paid in full. If Mac Repair should need to engage a debt recovery or legal firm you will incur additional charges as per the Late Payments Commercial Debts (Interest) Act 1998. Services may also be suspended at any time and without notice should your account remain outstanding in excess of 45 days. formation accessible over or through the Site. Your local engineer is directly responsible for your items. • Copyright: Copyright of all material originated by North London Mac Support (N.L.M.S or NLMS), either in the form of pre-contract documentation or as text, images, research papers or electronically stored code for the manipulation, transmission and presentation of information, remains vested in North London Mac Support (N.L.M.S or NLMS). By separate negotiation and upon payment in full, copyright may be assigned or licensed to the client. We are not responsible for typographical errors in any of our literature. • Liability: North London Mac Support (N.L.M.S or NLMS) shall under no circumstances be liable for any loss, damage, expense or injury of any kind. Whether direct, consequential or otherwise, arising in connection with the execution of a contract or the use or failure of the goods supplied or any defect in them, or from any other cause whether or not due to the acts or omissions of North London Mac Support (N.L.M.S or NLMS), its staff, contractors, or its agents, in excess of the contract invoice value. • Force Majeure: North London Mac Support (N.L.M.S or NLMS) shall not be liable to the client for any loss or damage which may be suffered by the client as a result of the delivery of goods, materials or the execution of a contract being delayed prevented hindered or made uneconomic by reason or circumstances or events beyond North London Mac Support (N.L.M.S or NLMS)’s control including, but not limited to: (a) Act of God, or riot, strike, lock-out, trade dispute, labour disturbance, restriction or ban on overtime, accident, fire, flood or storm difficulty or increased expense or; (b) Failure by the client to give adequate instructions or supply the necessary information in due time or (c) Failure by any third-party to carry out their part of the work or otherwise perform their obligations when required. • Claims: All claims in respect of material, goods or non-execution of the Contract must be made in writing and received by North London Mac Support (N.L.M.S or NLMS) no later than fourteen (14) days of the date of delivery to the client, the client’s premises or the Client’s vehicle, or in the case of electronic transmission, from the date of transmission. • Waiver: Any waiver by North London Mac Support (N.L.M.S or NLMS) of any breach of any term of these Terms and Conditions shall be valid only if given in writing. • Severance: North London Mac Support (N.L.M.S or NLMS) and the client believe that these Terms and Conditions are reasonable. If any provision shall be held to be contrary to applicable law, such provision shall be severed from the remainder, and the remainder shall continue in full force and effect. • Law: All contracts to which these Terms and Conditions apply shall be governed and construed in accordance with the laws of England and Wales, and the parties hereby submit to the jurisdiction of the courts of England and Wales.